The East Bay AFP is a chapter of the California Academy of Family Physicians. We represent and support Family Physicians who work or live in Alameda and Contra Costa Counties. Numbering almost 500 members, we are a group with incredible diversity in practice and interests, spanning the rural East to the more urban West. The East Bay AFP is a community that supports physician wellbeing and meaning in practice with an outward focus as champions for Family Medicine and for our communities. The East Bay AFP was well represented at the CAFP's most successful All Member Advocacy Meeting (AMAM) and Lobby Day to date. 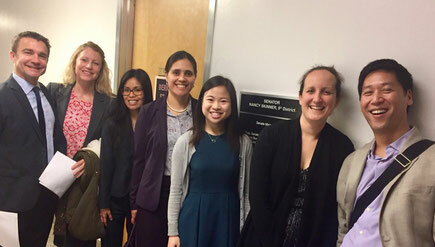 Dr. Chrissy Chavez-Johnson provided testimony on a chapter-sponsored resolution for developing toolkits for dealing with Immigration and Customs Enforcement (ICE) presence in ambulatory care settings. Members also communicated the importance of AB2895 (Transparency in primary care spending) to our local assembly members and senators. Our chapter hopes to send a full delegation to next year's AMAM, as well as author resolutions relevant to our area's practice and health of our communities. Please email at info@eastbayafp.org to be part of this advocacy effort!